Manually operated notchers suit well the flexible and economic production of small to midsized batches of laminations, used in electric motors and generators. 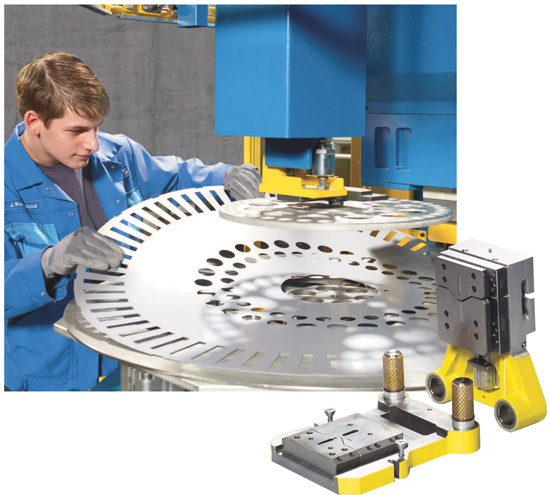 But when production ramps up to larger lot sizes, controllable dies that produce the stator and rotor in a single step will save valuable handling and setup time. To understand just how quickly the investment in controllable dies pays off, consider analysis performed using Schuler’s new eCon software, which calculates the breakeven point based on a variety of operating parameters. In the case of a conventional single notch, the operator first inserts the blank, the notcher cuts the stator notches and simultaneously cuts out the blank for the rotor, and then the operator removes the two blanks. He then needs to change the die for the next step, inserts the rotor blank, and the finished rotor is and removed. Using a controllable die, the stamper can notch the stator and rotor with a single clamping operation. The eCon analysis tool reveals that investing in a controllable die makes sense with an annual output of at least 100,000 rotors and stators, with a return on investment of 6 months. Of course, Schuler recommends conducting individualized analyses using eCon and accounting for a user’s unique operating conditions—number of shifts per day, hours per shift, hourly wages, press stroking rate, loading and unloading time, energy and space costs and the external diameter of the laminations.